Our increasing reliance upon mobile computing has introduced many new security risks. These devices and applications know where we are, who we were there with, and what we were doing. They know what we've bought. We also use them to make phone calls, take pictures, and even video conferencing. To the bad guys, access to this information can be very valuable. 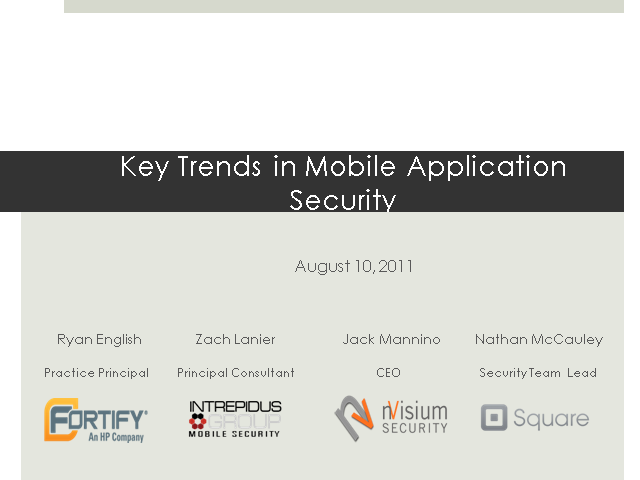 In this presentation, we will discuss the new risks and security challenges with mobile computing. We will discuss the security maturity of both the applications and the underlying platforms themselves. The panel members will also talk about currently emerging areas of risk going forward. Finally, they will wrap things up by presenting solutions to solve today's security challenges.